In general, potato harvesters (diggers) can be classed as one-row and two-row tractor-drawn machines. The two –row machines can be further divided into three types, namely, two-unit or separate apron; the two-row, open-throat, connected apron; and the combination digger-cleaner-sacker, or leader. The last can be called a potato combine. The one-row and two-row potato harvesters are dawn behind the tractor, but the elevating and shaking apron is power-takeoff-driven. A long power shaft extends from the power takeoff to an enclosed gearbox on the harvester. This gearbox usually consists of a three-speed transmission which permits the elevator to be operated at speeds suited to the field condition. Several types of digging blades are available. The blade is run deep enough to scoop up the buried potatoes. The complete mass of soil and potatoes is delivered to a travelling elevator chain which is agitated up and down by elongated sprockets on each side of the chain. This agitation shifts loose soil through the links of the chain, which are usually offset alternately; that is, one link is high, while the next link is set low, the chain belt may be constructed as a continuous belt from front to rear, or it may be divided into two sections. The two-row potato harvester consists of two sets of digger blades and conveyor shaker belts. The whole unit is usually power-takeoff-driven, but some machines may be equipped with an auxiliary engine. 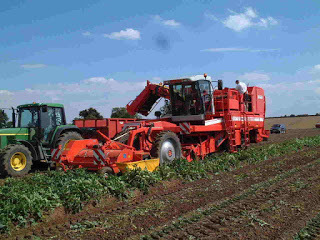 Some two-row machines drop the potatoes on the ground while others deliver the potatoes into a tank on the machine or to a truck driven along beside the harvesters. The depth of the digging blades is controlled by hydraulic cylinders. Most potato growers use chemicals to kill the tops or powered-operated flail-beaters to dispose of the vines and weeds before operating the potato harvester. 0 Response to "Potato Harvesters"